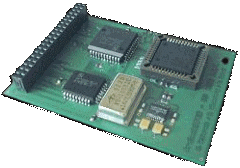 In 1996 I started building my own soundcard for the Amiga system because none of the existing ones really satisfied me. They were either far too expensive or not good enough. 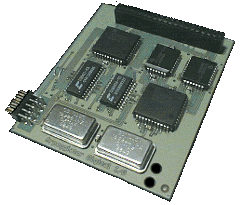 The first prototypes were ugly and unstable but soon, after designing a proper multilayered PCB it was ready for preseries production. Marc Albrecht, a very good friend of mine helped me by writing the software and getting all the needed parts and in 1997 it was ready for a first presentation in Trier. Meanwhile the Prelude has become a whole product range including two soundcard models and several expansion devices. All of them feature true 44.1 kHz and 48 kHz sampling rate support without the need for lossy resampling known from most PC soundcards. However, because of the decreasing Amiga market the Prelude is out of production by now. A mirror for software downloads is here. The Prelude mainboard came with a 40-pin expansion connector because I planned to add digital inputs and outputs so that I could connect it to my DAT recorder. The digital I/O expansion module is called Arpeggiator and it's practically a soundcard on its own. 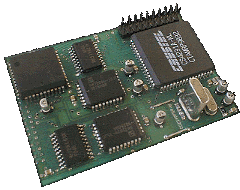 It uses the buffered data bus of the main Prelude board and its address space but different applications can use the analog and the digital part at the same time and almost completely independent of each other. Two friends of mine, Dirk Düsterberg and Klaus Woltereck have developed an MPEG audio decoder board for the Prelude. It can play Layer3 streams at almost no noticeable system load even on very slow systems at a sound quality better than most software based decoders. It's called MPEGit. People kept asking for a 'soundcard' that they can use in their standard A1200 which doesn't have any Zorro expansion slots. To satisfy their needs I've changed the original Prelude design so that it fits into the A1200's RTC/memory expansion bay known as 'clockport'. Actually this is a weird hardware hack but it works in most cases. It has almost all the features of the full size ZorroII Prelude, including the analog mixer, precise sampling rates and a proper connection terminal.